Contactez-nous pour connaître le prix de vos jumelles Kowa en précisant les modèles qui vous intéressent. Les Kowa BD XD sont des des jumelles d'ornithologie et de chasse de niveau supérieur, avec une optique XD Prominar (extra-basse dispersion) qui élimine toute aberration chromatique. Elles sont particulièrement compactes et légères et jouissent de prismes à correction de phase et traitement C3 super haute réflexion (99%). Garanties 10 ans. Kowa has an optic that stands out from the crowd in terms of its performance at its relative price point. They feel great in the hands, and they deliver sharp, bright image quality with low chromatic aberration, great flat field and above average depth of field.(...) If you are in the market for a low-to-medium priced binocular, you seriously need to try out and consider the Kowa BD42-XDs. 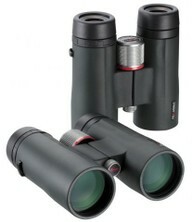 Taking into account its price the result this pair of binoculars got in our test is really impressive. It corrects well or very well all basic optical aberration, its build quality is very solid, it is properly blackened and the interior of the tubes is very clean. What’s more the exit pupils are almost round and they are positioned against a nice, dark background. If you add to that a very handy and stylish casing, very comfortable to hold, even the biggest malcontents won’t have anything to say. I do not hesitate to say it is actually one of the best options, available on the market. If you intend to spend only around 2000-2500 PLN on a pair of binoculars it would be really difficult to find anything better. Anyway we recommend it wholeheartedly.